What Is Kimberly-Clark’s Outlook For 2019? How Are Kimberly-Clark’s Revenues And Earnings Likely To Change Over The Next Five Years? What is Kimberly-Clark’s Fundamental Value Based on Expected 2018 Results? How Have Kimberly-Clark’s Revenues, Expenses & EBITDA Changed Over The Last Five Years? What Are Kimberly-Clark’s Key Sources Of Revenue? Can Cost Savings Sustain Kimberly-Clark’s EPS Growth In Fiscal 2018? Kimberly-Clark (NYSE: KMB) reported mixed second quarter earnings, as its earnings per share came in ahead of market expectations, but revenue missed. The company’s results were impacted by a difficult environment, particularly significant commodity inflation. 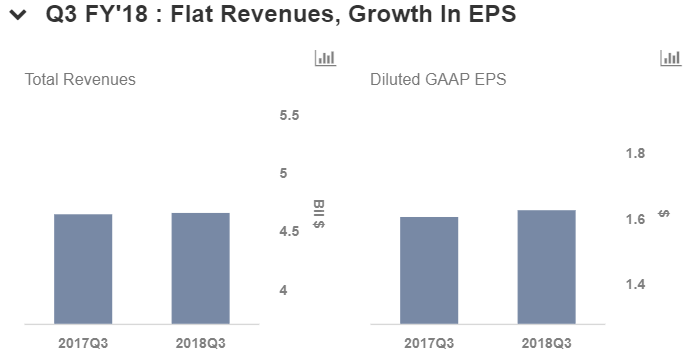 In Q2, the company’s net sales grew slightly to $4.6 billion, primarily due to flat organic sales, as a marginal decline in net selling prices and volumes was offset by a 1% year-over-year (y-o-y) increase in product mix. During Q2, the company saw gains in the Consumer tissue and K-C Professional segments which offset weakness in the Personal Care segment. In terms of bottom line, Kimberly-Clark’s adjusted earnings per share grew 7% y-o-y, driven by strong cost savings and reduced overhead spending. Kimberly-Clark’s stock price has declined more than 10% over the course of 2018, due to falling prices and rising cost inflation. Our $108 price estimate for Kimberly-Clark’s stock is slightly ahead of the current market price. We have created an Interactive Dashboard for Kimberly-Clark which outlines our forecasts for the company’s Q3 and full-year fiscal 2018 results. You can modify our forecasts to see the impact any changes would have on the company’s earnings and valuation. We expect the company to continue to post an increase in earnings growth rate in Q3, driven by innovation-led new product launches, share repurchases, cost-saving measures, and lower effective tax rate. Below we outline certain key trends that we expect for the company in fiscal 2018 going forward. Kimberly-Clark’s second quarter adjusted gross margin was 33.4%, down 270 basis points y-0-y. In addition, the company’s adjusted operating margin was down 100 basis points to 16.8%. The primary reason for this decline was higher pulp and raw material cost and inflation. We expect the continued cost pressure from inflation in raw materials and input costs to hurt the company’s margins, as the company has guided for full-year cost inflation between $675 million and $775 million compared with the previous view of $400-$550 million. In addition, some big-box retailers’ aggressive push towards launching their own private-label products could impact Kimberly-Clark’s shelf space, which could again put pressure on its margins. Kimberly-Clark’s adjusted EPS has grown from $4.80 in 2011 to around $6.2o in 2017, despite the company’s revenue falling by over $1 billion during this period. The company has been able to sustain its EPS growth largely due to its successful cost-saving initiatives. However, bottom line growth without a significant top-line expansion is unlikely to be sustainable in the long term. Going forward, Kimberly-Clark’s gross margin could reach a saturation point with only cost saving initiatives supporting it. In Q2, Kimberly-Clark achieved $110 million of FORCE cost savings and continues to target $425 million to $450 million of savings for the full year. In fact, the company also expects full-year savings from its restructuring program between $100 million and $120 million, which is $50 million higher than its original target. The company had announced its restructuring program as part of a multi-year cost savings target, in which it has set a four-year cost savings target of more than $1.5 billion. These savings will be planned by improving productivity at manufacturing facilities, optimizing raw material and product design costs, generating benefits from procurement activities and improving distribution efficiencies. Kimberly-Clark expects the program to generate annual pre-tax cost savings of $500 million to $550 million by the end of 2021 through workforce reductions in the range of 5000 to 5500, or about 12% to 13% of its total workforce. Additionally, this program is expected to broadly impact all of the company’s business segments and organizations in each major geography. Markets outside North America remain an area of strength for the company, as almost 48% of the company’s sales are observed here. In Q2 2018, Kimberly-Clark’s net sales in these markets grew 2% y-o-y, as compared to a 1% y-o-y decline in the North American market. The company is looking at developing and emerging markets to drive growth, as it struggles in the North American market due to weak pricing and market saturation. The company has strong growth prospects in markets such as China and Brazil, primarily due to low penetration of its category products in these regions, and the likely increase in the consumption of these products with economic development. We expect this market to be a key driver for Kimberly-Clark’s long-term growth. For full-year 2018, Kimberly-Clark expects its net sales and organic sales to grow by 1% y-o-y. The company reduced its adjusted earnings outlook to $6.60 to $6.80 from a previous estimate of $6.90 to $7.20, due to significantly higher commodity costs and the recent weakening of many foreign currencies. Further, the company continues to implement sheet count reductions in North America and increase prices in Latin America. In addition, it also plans to raise prices in other international markets in its Consumer Tissues and K-C Professional business in 2018. We expect Kimberly-Clark’s personal care segment to drive revenue growth in 2018, as it has been successful in maintaining its market share in Eastern Europe and China, primarily as a result of price cuts. Going forward, the company plans to launch new innovations in Huggies Snug and Dry diapers, Goodnites Youth Pants and Depend underwear, which could increase its market share in the global baby and feminine care market going forward. This segment is responsible for half of the company’s total sales.